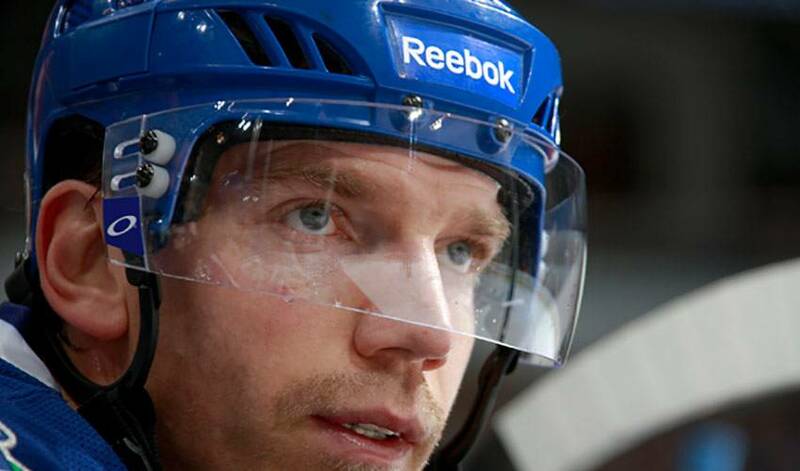 Mikael Samuelsson certainly knew he scored two goals in a key win for the Vancouver Canucks. What the veteran forward didn't know was that he had reached a personal milestone in the process. It was an important triumph for Vancouver, a 4-2 home win over an equally hot Calgary Flames club looking to secure a playoff berth in the wildly tight Western Conference. Samuelsson's scored twice in a 2:40 span midway through the second period, earning him first star honours while maintaining his status as one of the team's hottest scorers. The tallies also gave the veteran forward 300 points for his NHL career. And that, for those who don't know much about the 34-year-old, is a perfect illustration of Samuelsson, a player who didn't quite have lofty expectations, at least in the early stages, when it came to his NHL career. Samuelsson began his career in Sweden, starting with Södertälje SK as a junior in 1994. He went on to play for Swedish teams IK Nyköping, Frölunda HC and Brynäs IF, was selected 145th overall in the 1998 NHL Entry Draft by the San Jose Sharks and launched his NHL career in 2000–01. Better than good, most would say. After short stints with the Sharks, New York Rangers, Pittsburgh Penguins and Florida Panthers, Samuelsson returned to Europe and played in both Switzerland and Sweden during the 2004–05 NHL lockout. When NHL play resumed, Samuelsson signed with the Detroit Red Wings, winning the Stanley Cup with them in 2008. After four seasons in Detroit, he signed with the Canucks in July of 2009. Samuelsson scored a career-best 30 goals and recorded a career-high 53 points in his first campaign with the Canucks. This season, he's hit his best stride at the most crucial stage of the year, as Vancouver looks to keep their status as the No. 1 seed in the West and first overall in the league. “It's not always about scoring goals,” said Samuelsson, who has had a highly-decorated international career, winning gold medals with the Swedish national team at the 2006 Winter Olympics and 2006 World Championships. “Sometimes you have to fight through the hard times. Playing on a line with Ryan Kesler, in the midst of his finest NHL season, and Mason Raymond, the talented young forward who has battled a slew of injuries, Samuelsson is feeling more and more confident in the trio's ability to create chances. And though he might not know how many career games he's skated in (600 and counting), Samuelsson hasn't forgotten the impact NHLPA members can have on their young fans. Teaming with the NHLPA's Goals & Dreams Fund, the largest program of its kind in the world, one that has provided nearly $20 million since its inception in 1999, in support of grassroots hockey, Samuelsson donated 25 complete sets of brand-new hockey equipment to children in the Mariefred IFK program. Recalling his personal hockey highlights, however, isn't likely to happen any time soon.